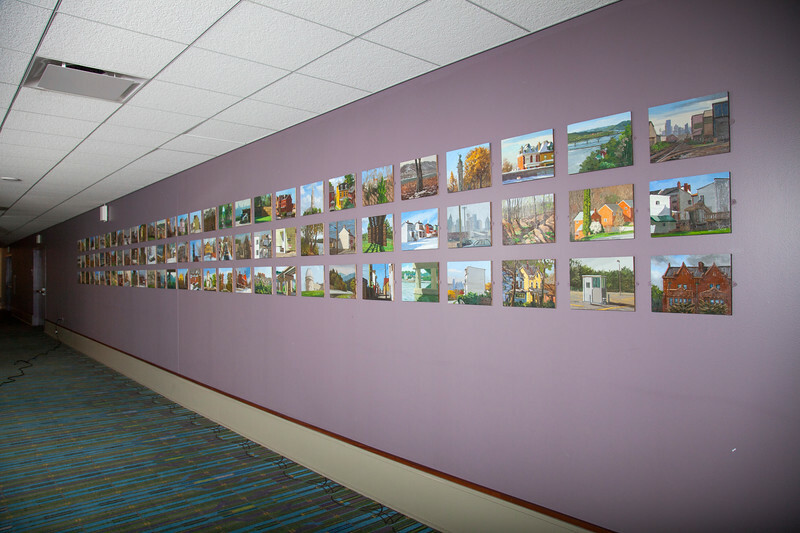 Donoughe’s collection of 90 paintings that the Pennsylvania Convention Center acquired is rightfully titled Essence of Pittsburgh (Pennsylvania) as it captures just that. Each of the 90 panels measures 9” x 12” and was painted on location in plein air to capture the natural light and shadow of a particular time and place. The urban landscape is always in a state of flux: changing time of day, climate, and seasons, shifting from construction to demolition and back again. The individual pieces are like notes in a melody with the whole being greater than the sum of the parts. Together they represent Donoughe’s felt experience of being one with the subject he has come to know and love. A native of Loretto, Pennsylvania, now living in Pittsburgh, Donoughe is known for painting on location throughout the year. His works can be found in the Southern Alleghenies Museum of Art and The Westmoreland Museum of American Art.